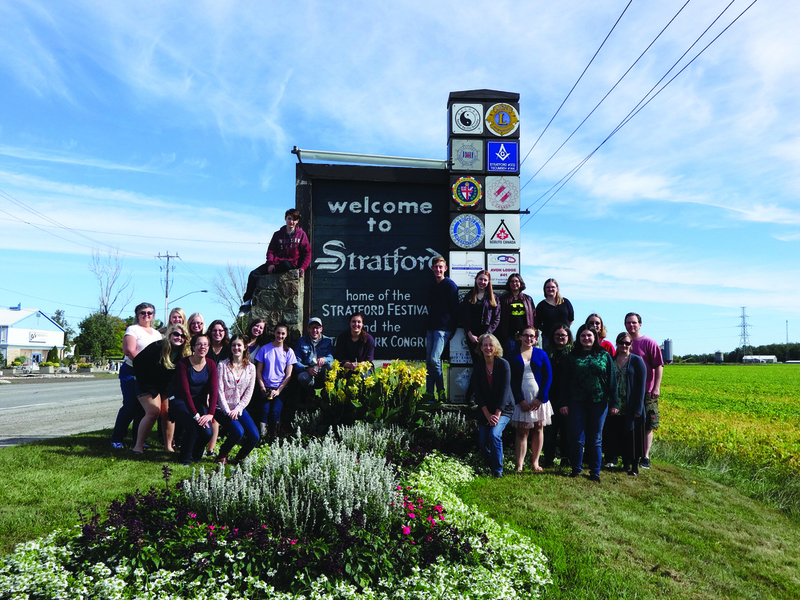 Early Friday morning in the Student Center circle, 26 students and faculty members for the English and Theater departments embarked on the eight hour van ride to Stratford, Ontario for the annual trip to the Stratford Shakespeare Festival. When the students arrived on Friday afternoon, they checked into the hostel and then were free to wander the town until the 8 p.m. play. Students had the choice of three plays. The first choice was the Greek classic, “Oedipus Rex.” It’s about a king who needs to solve a decades -old murder to stop a plague. He then uncovers several dark secrets. Students could also see Shakespeare’s “The Taming of the Shrew.” It’s a strange comedy about marriage and obedience. “It was really traditional and they didn’t do anything different with it, but it was still good,” Emily Helderman, ‘16, said. Or lastly, they could go to Rodgers and Hammerstein’s “Carousel.” The musical was a troubled love story taking place in a small New England town. On Saturday morning, students were free to explore the town. There was shopping and food, and this year’s trip coincided with Stratford’s twentieth annual Dragon Boat Festival. The event is an all-day secession of Hong Kong-styled boat races. Teams consisting of 20 rowers and a drummer propel a long dragon-shaped boat towards the finish line on Lake Victoria. This event lasted all day, even through the 1 p.m. downpour that caught some Wittenberg students. At 2 p.m., all of the group members attended the matinee showing of “Hamlet,” the Shakespearean tragedy about a Danish Prince’s quest for revenge after his father’s ghost accuses Hamlet’s uncle of murder. The group then had a Q & A with actor Tim Campbell, who played Horatio, and actor Juan Chioran, the Player King. After they met with the students, they understood why the line about Hamlet returning to Wittenberg had gotten a laugh, something that had confused the actors previously. After, there was a dinner and then the students had another choice of three plays. The first was a rendition of “The Sound of Music.” This musical is about the relationship between nun Maria and retired captain Georg Von Trapp. “It was absolutely beautiful, and the singing was great,” Glaser said. Another choice was “The Alchemist,” a play written by Ben Johnson who wrote in the same time as Shakespeare, about a group of conmen using made-up jargon about magical-science to steal people’s money. “It was really, really funny,” Hickey said. The final choice was “She Stoops to Conquer.” The eighteenth century play was about a wealthy woman trying to woo a man while pretending to be a barmaid. After the plays, the students were once again free to either go back to the hostel or explore the town’s night life just a little more. And on Sunday morning, the group set off on yet another eight-hour ride back to Wittenberg’s campus.